An online bachelor’s degree in nutritional sciences will allow you to help people make scientifically driven food choices. While proper nutrition is a cornerstone of a healthy lifestyle, many people do not understand how their diet affects their bodies. Dietitians often work in medical settings, creating healthy meal options for patients recovering from illnesses, such as an eating disorder. Nutritionists have a similar knowledge base, but they usually test food nutrition in an industrial or scientific setting. Nutritional scientists earn an average salary of $58,920, and the Bureau of Labor Statistics projects that the field will grow 14% between 2016 and 2026. Graduates with a bachelor's of science in nutrition should have no difficulty finding work. University of Alabama ranks #1 on The 6 Best Online Bachelor's in Nutritional Sciences Programs! As Alabama's flagship university and first public college, UA promotes excellence in both on-campus and online education. Scores of nationally recognized faculty have helped develop highly ranked programs, through which many students earn prestigious awards. Many begin their undergraduate journey at Bama by Distance, UA's online campus. The school's bachelor of science in food and nutrition satisfies the requirements needed to become a registered dietitian (RD). The program comprises 120 credit hours of coursework divided by 56 hours in the major, 20 hours of science prerequisites (which must be completed in person, on campus), and 44 hours of general education. Students study the relationship between nutrition and human health through courses such as nutritional biochemistry, medical nutrition therapy, food service management, and the nutrition care process. The program culminates in 160 hours of supervised field experience at a site of the student's choice. Distance learning applicants must have a high school GPA of at least 2.5 or a college-level GPA of at least 2.0. Applicants do not need to submit high school transcripts if they have completed at least 24 credit hours of eligible college coursework. UA accepts transfer credit from other regionally accredited schools, and also offers distance learners credit for prior work and/or life experience. UA is regionally accredited by the Southern Association of Colleges and Schools Commission on Colleges (SACSCOC). Its online nutrition degree is one of few distance learning programs accredited by the Accreditation Council for Education in Nutrition and Dietetics (ACEND). Kansas State University ranks #2 on The 6 Best Online Bachelor's in Nutritional Sciences Programs! With three locations serving 24,000 students, K-State's Manhattan campus attracts the most multicultural students and high school graduates in Kansas. The university also highly values ambition and and affordability overall; its bachelor's degree graduates boast a 94% job placement rate, and out-of-state students pay the same tuition as residents. K-State offers its bachelor of science in nutrition and health through a partnership between the College of Human Ecology and the Global Campus, which has delivered distance education for more than 50 years. The 120-credit degree completion program connects food and nutrition to illness, wellness, and other stages of the life cycle. The curriculum encompasses 58 hours of general courses, including social and natural sciences, communications, humanities, quantitative studies, and one human ecology course, up to 18 hours of unrestricted electives, and 47 hours of major courses. The latter combine food and nutrition with business operations, management, science, and counseling. Additionally, a didactic program in dietetics involves supervised practice experiences that satisfy programmatic accreditation requirements. Students may transfer credits from another university or community college to meet general requirements. Applicants to the bachelor in nutrition science must have earned at least 30 college credits, in courses such as chemistry, biology, anatomy, and physiology, with at least a 2.0 GPA. K-State is regionally accredited by the Higher Learning Commission of the North Central Association of Colleges and Schools (NCA). Its didactic program in dietetics is granted continuing accreditation by ACEND. University of Arizona ranks #3 on The 6 Best Online Bachelor's in Nutritional Sciences Programs! Established in 1885 as a land-grant university, UA ranks among 62 leading-edge national research institutions comprising the Association of American Universities. UA emphasizes experiences beyond the classroom through its "100% Engagement" initiative; 100% of its associate and bachelor's students graduate with proven experience in their major. One of more than 80 online degrees, the bachelor of science in nutritional science integrates nutrition with medicine, cell biology, biochemistry, and food chemistry. Students can specialize in one of two emphases, in dietetics or nutrition. The program's dietetics option prepares students to become RDs and the nutrition option enables students to continue on to graduate study in related fields. Unique courses include sports nutrition, combining nutrition and exercise physiology through applied science; diet genes and disease, using diet to prevent disease and improve quality of life; and experiential learning in nutritional sciences, a volunteer opportunity with a class component exploring marketability for future employment. UA requires students to complete prerequisites — either by transfer or in person — in general chemistry, organic chemistry, general microbiology, and biology of microorganisms. Besides these prerequisites, applicants need only submit an online application and transcripts. A pay-per-credit tuition system makes nutrition one of UA's most affordable online programs. Flexible start dates allow distance learners to work at their own pace. Most degree seekers complete the program in four years. UA is regionally accredited by the Higher Learning Commission. Arizona State University–ASU Online ranks among The 6 Best Online Bachelor's in Nutritional Sciences Programs! ASU ranks among the Carnegie Foundation's "Highest Research Activity" public research institutions. The university's distance learning campus, ASU Online, enrolls more than 30,000 students in over 150 programs, several of them nationally ranked. All are fully online and offer six start dates per year. ASU Online also maintains unique partnerships with edX, offering free online courses and full tuition coverage to eligible employees. ASU delivers its bachelor of science in nutrition through the College of Health Solutions, a department that produced 247 Barrett Honors scholars in 2016 and whose faculty are involved in cutting-edge research projects including the impact of the environment on food security. The BS in nutrition online curriculum comprises 120 credit hours, or 40 classes. A minimum of 30 must be completed at ASU. Each course takes 7.5 weeks to complete. Students choose from three professional tracks: food and nutrition management, nutrition communication, and food studies. In addition to core areas like health and wellbeing, cultural aspects of health, social statistics, and development of healthy cuisines, students can hone in on unique specialties, such as persuasion and social influence, under the nutrition communication track. Distance learners can join ASU Online's student community Sun Devil Nation, through which they can connect with peers and network with fellow local ASU alums. ASU also emphasizes strong support services for its online students, from tutors to academic success coaches, career services, and study abroad opportunities. Arizona State is regionally accredited by the NCA. Eastern Michigan University ranks among The 6 Best Online Bachelor's in Nutritional Sciences Programs! Located eight miles east of Ann Arbor in Ypsilanti, EMU is among Michigan's most comprehensive public universities. EMU offers 36 extended programs, including 19 by distance, as part of EMU Online. Online students pay in-state tuition rates regardless of their place of residence, however, only students in SARA member states are eligible to apply. The dietetics program, in which students complete theory and supervised practice concurrently, can be completed as either a master of science or bachelor of science degree. To apply, students need a cumulative GPA of 2.75 and a prerequisite GPA of at least 3.0. Prerequisites include six pre-application courses: human physiology, microbiology, organic chemistry, biochemistry, careers in nutrition and dietetics, and human nutrition. In the major, students take courses in topics including nutrient metabolism, food and culture, integrative medicine, and development of the entrepreneurial dietitian. Several courses include writing intensives and Learning Beyond the Classroom experiences: for example, the nutrition therapy experience encompasses three phases of medical site-based practice. The program can be completed entirely online. Distance students can access the same full suite of academic and career advising services as their on-campus counterparts. They can also earn credit for prior experience and transfer credits from other regionally accredited universities. Graduates of the bachelor's degree in nutrition science and dietetics who have completed at least 124 credits are eligible to sit for the RD exam. EMU is regionally accredited by the NCA and its coordinated program in dietetics is fully accredited by ACEND. 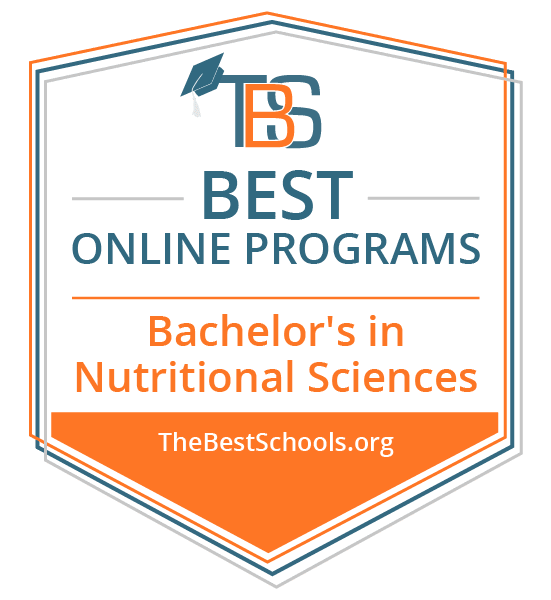 Texas Woman's University ranks among The 6 Best Online Bachelors in Nutritional Sciences Programs! As the nation's largest university for women, TWU also claims the distinction of graduating more healthcare professionals than any other institution in Texas. One of three locations, the school's Denton, North Texas campus provides the ideal setting for aspiring food and nutrition professionals, as the home to many of the largest food manufacturing companies in the U.S. TWU's nutrition and food sciences department offers several one-of-a-kind online or hybrid programs, and outstanding internship opportunities with companies like Frito-Lay and Tyson Foods. TWU's bachelor of science in nutrition offers three distinct emphases: dietetics, nutritional sciences, and wellness. The dietetics track prepares students to become registered dietitian nutritionists (RDNs). The degree encompasses upper-level courses in nutrition, food science, food service management, and medical nutrition therapy; a 6-to-24-month dietetic internship; and a didactic program in nutrition and dietetics accredited by ACEND. Graduates boast a 95% one-year pass rate on the RDN exam. Nutritional sciences caters to students interested in a career in teaching or research. The program requires 120 hours of coursework, including upper-level classes in nutrition, bio nutrition, and community nutrition. Students also have the opportunity to partner with faculty on state-of-the-art research projects. The wellness emphasis prepares students to pursue certified health education specialist (CHES) credentials. The 120-credit curriculum includes upper-level coursework in microbiology, nutrition and food science, and health promotion planning and design, plus 27 semester hours of health studies in preparation for the CHES exam. Students complete the program in an average of four years, as online and on-campus courses follow the same schedule. Online students can access virtual academic support services, including free tutoring services like Smarthinking and TWU Online's Writing Lab Live. Applicants from regionally accredited Texas high schools and/or who ranked in the top 25% of their graduating class are automatically admitted into the program. TWU is regionally accredited by SACSCOC. The bachelor of science in nutrition is accredited by ACEND. Dieticians and nutritionists have a similar educational background. Both begin their online nutrition degree education with a foundation in biology, chemistry, and physics. From there, you move on to other topics, such as nutrient metabolism and the effect of social science on nutrition. Depending on your program, you may be able to choose a specialization to suit your personal interests and future career goals. At this point, you decide whether to become a nutritionist or a dietician. Many states strictly regulate the latter, so expect a more rigorous educational experience if you choose to become a dietician. Many bachelor's in nutrition science programs require students to complete an internship. Often, large food companies offer summer internships to nutritional science students. These internships take place on-site, so it's important to research each internship location to ensure an easy commute. If you perform well at your internship, you can build a professional network and gain letters of recommendation that may help your job search after graduation. The education and job experience dietitians and nutritionists receive prepares them for careers beyond the confines of nutritional science. The following options represent only three possible career paths available for degree holders with a bachelor's in nutritional sciences. Some jobs may require you to complete additional education. However, your background in nutritional science can benefit you in these and other careers. Health Educator: Health educators promote healthy habits by working within groups or one-on-one with clients. Health educators may also work for local governments, enacting proposals to improve community health. In this career, a background in nutrition gives you the knowledge necessary to help people and communities make better food choices. Registered Nurse: Nurses work alongside physicians to treat patients' injuries and illnesses. They spend much of their time with patients, making this career path an excellent choice for those with strong interpersonal skills. Becoming a nurse requires an associate degree in nursing and you must pass a licensure examination. Your nutritional science education may satisfy many of the academic requirements for becoming a nurse. Rehabilitation Counselor: Rehabilitation counselors work with patients who require assistance living independently. Their responsibilities include helping patients find appropriate housing and employment, monitoring a patient's progress, and connecting them to relevant social services. This career path requires a master's degree. A bachelor's in nutritional sciences, along with on-the-job experience, can distinguish you from other applicants applying to master's-level programs.